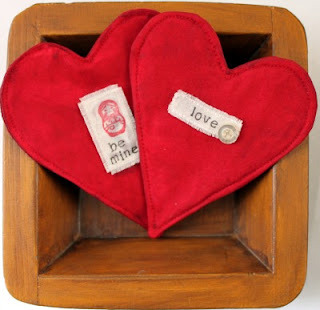 I guest posted with this tutorial over at At Home With K a couple of weeks ago as part of Kindra's Be Mine Bonanza. 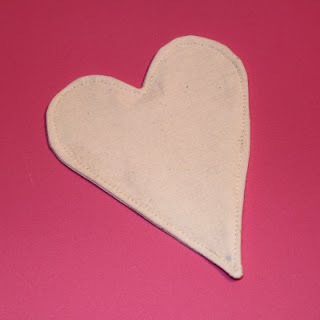 These painted muslin hearts have many decorative uses and are really easy to make. Let's get started! Create a heart template. I drew mine in Word and printed it on a piece of freezer paper, but you can also draw a heart by hand on a piece of paper or cardboard and cut it out. My template was 6" tall and 5" wide. 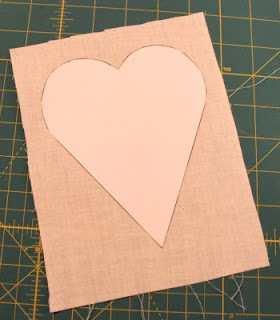 Using your template, cut out two hearts from muslin and one from batting. Pin your three layers together in this order... batting, muslin, muslin. I used a water soluble fabric pen to draw an outline around my outer piece of muslin about 1/4" from the edge. 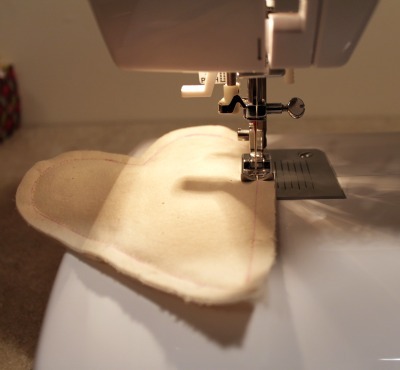 It's not necessary, but it makes it easier to sew evenly around both curves of the heart. 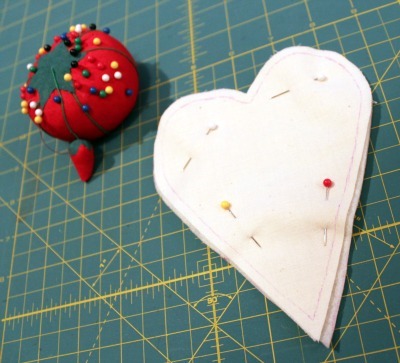 Sew around your layered heart about 1/4" from the outside edge. Leave a 2-3" gap along one straight edge for turning. Clip the point and curves of the heart, and turn it right side out. 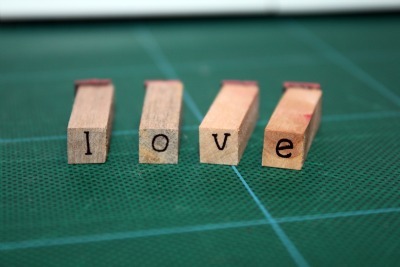 Press the heart, making sure to press in the raw edges of the opening. Topstitch around your heart about 1/8" from the outside edge. Now it's time to paint! 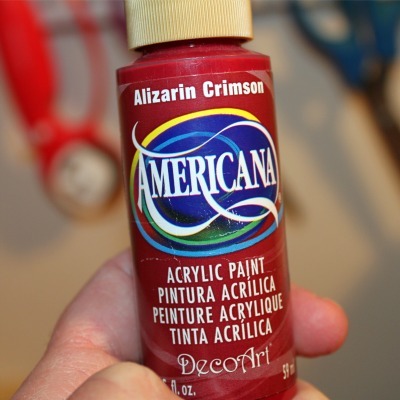 I used plain old acrylic craft paint that I had in my stash. 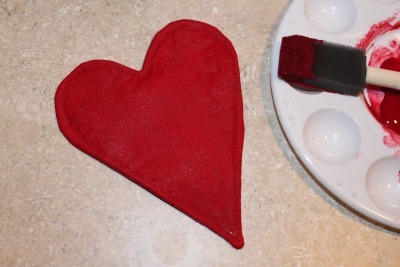 Use a foam brush to paint one side and the edges of your heart. Make sure you get everything covered with the first coat. Maybe it was just my paint, but any areas that got paint on them after the first coat dried looked uneven. Once the first side and edges dry, turn it over and paint the other side of your heart. Now it's time to embellish. I decided to add a message to my heart. 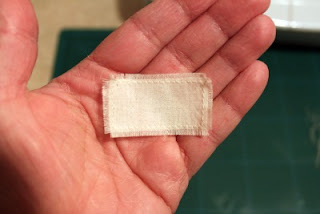 I took a scrap of muslin and sewed a rectangle on it. Then I trimmed the edges of the fabric to about 1/8" from the outside edges of my stitches, and I frayed the edges of the fabric. Next I got out my rubber stamps. I bought a set of letter stamps for $1 at Michael's a while back, and I've gotten a lot of use out of it. 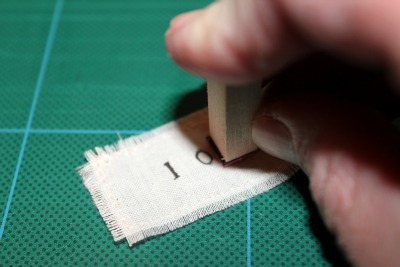 When I stamp on fabric, I use a permanent, waterproof pen to coat each letter stamp. I feel like I have better control over the ink on the stamp when I use this method. 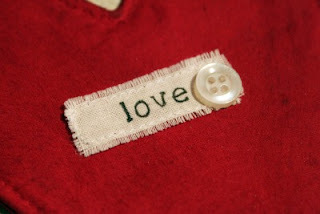 To finish off my heart, I glued my "love" tag onto the front and then glued a small button on top of that. 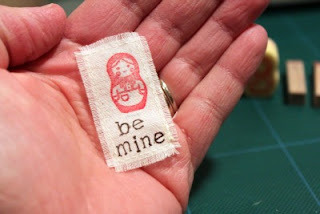 I made another patch for a second heart using my letter stamps and a little matryoshka doll stamp. Now you've got this cute little heart that you can use in several different ways. 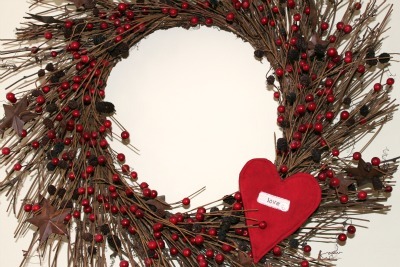 You can glue a loop of twine on the back and hang it on a door or on the wall. You can add it to a wreath. 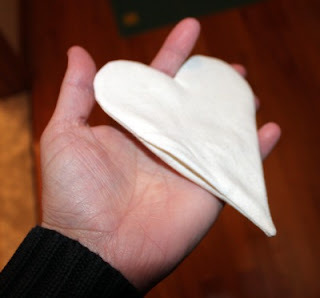 Or you can make a couple of hearts and use them as bowl fillers, which is how I plan to use mine. 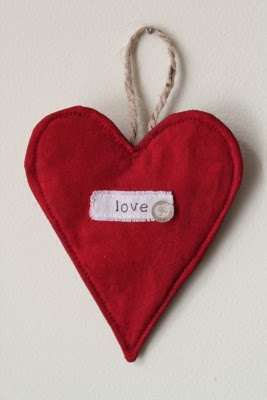 These hearts are so versatile, and I'd love to see all the creative ways that people embellish them and use them to decorate their homes. So sweet and pretty! I love your stamps...man I could use some of those. This is really cute Gwen! I love the idea of painting them to give them some body and a totally different texture. 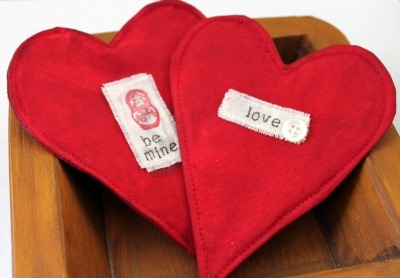 And I love the embellishments- so sweet. Very cute! 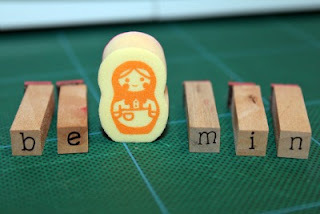 I need to get some of those alphabet stamps...I've seen so many cute projects with them! I must find those stamps!!! Love this! Hi Gwen...I wanted to stop by and thank you for your comment on the guest post I did over at Pick Up Some Creativity. I just love this heart project. Such a great idea to paint the muslin! I also noticed in your profile that you're from Ct...we're neighbors! I'm in RI. Gwen - these little hearts are adorable! I never would have thought to paint them. Hope you had a lovely vacation! So cute, Gwen! Love it! These are adorable, Gwen! I love the little patches! I love the stamps you've used. 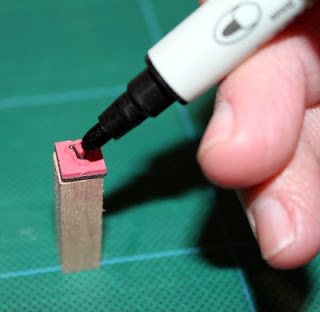 It's a great idea to use a marker instead of a stamp pad. I'm going to try that method this afternoon. I love your site. Everything you make is so lovely. Absolutely brilliant. I've awarded you a blog award. Have a look at www.homemakinghoneys.com Stop by and have a look!! This is so fab gwen, love it. I wouldn't have thought about painting on muslin! These are adorable Gwen!! I love the little stamps that you added.